Aldfield is a small village in the Harrogate district of North Yorkshire, about 3 miles West of Ripon. Last weekend we escaped London and visited friends here. A slow weekend of fresh country air, crisp winter walks and cosy drinks by the fire. I did zero research for this trip because I think when staying with friends it’s far nicer to go with the flow, though I still took plenty of photographs of my favourite sights and of course have a foodie recommendation or two. Waking up on the farm to the early morning sunrise and rolling green fields felt instantly calming. We spent time in Ripon, wandering it’s old cobbled streets, decorated with miniature Christmas trees, twinkling lights and festive wreaths. With endless English countryside stretching out beyond the farm, we set out to explore. 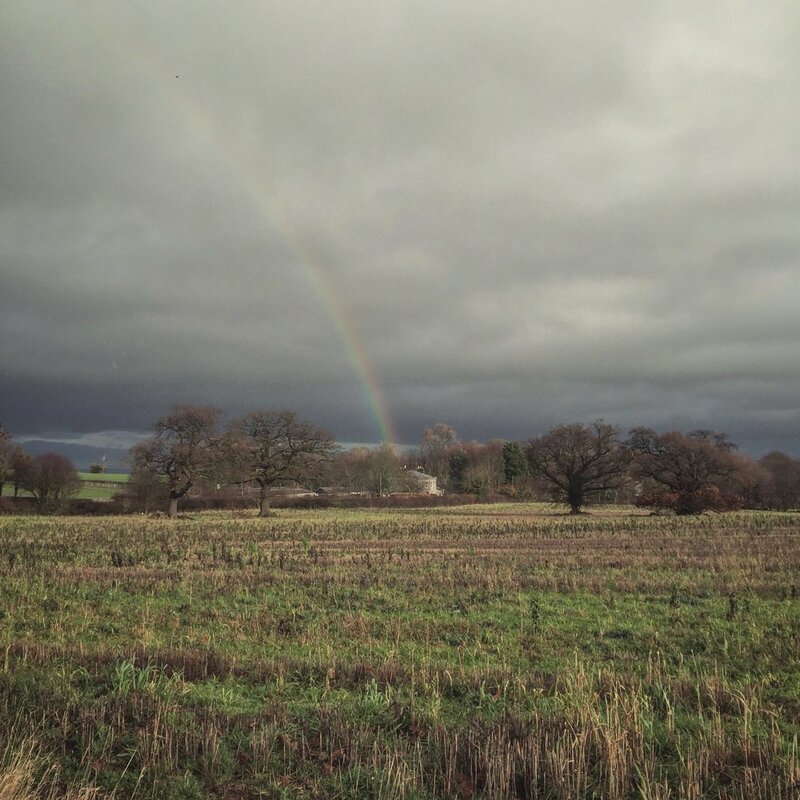 Sunshine turned to grey drizzle in a matter of moments, adorning the heavens with a rainbow before the low Winter sun made a reappearance, casting it’s golden glow on rust coloured trees and puddle strewn tracks. Pretty pheasants wove through the long grass, flickers of their jewel coloured heads giving them away and we caught sight of a bashful roe deer, flashing its fluffy white derriere as it fled. I just adore being outside at this time of year, the smell of woodsmoke drifting on the crisp, cool air and the promise of a comforting cup of hot tea to warm up once back indoors! I headed back to London with muddy boots and a heavy heart but also with excitement in anticipation of making a return to Yorkshire in a few weeks time for a Christmas getaway with my family.